The first paper with Ph.D. candidate Md A. Sayeed was awarded the Best Poster of the Conference with a cash prize of $1000. 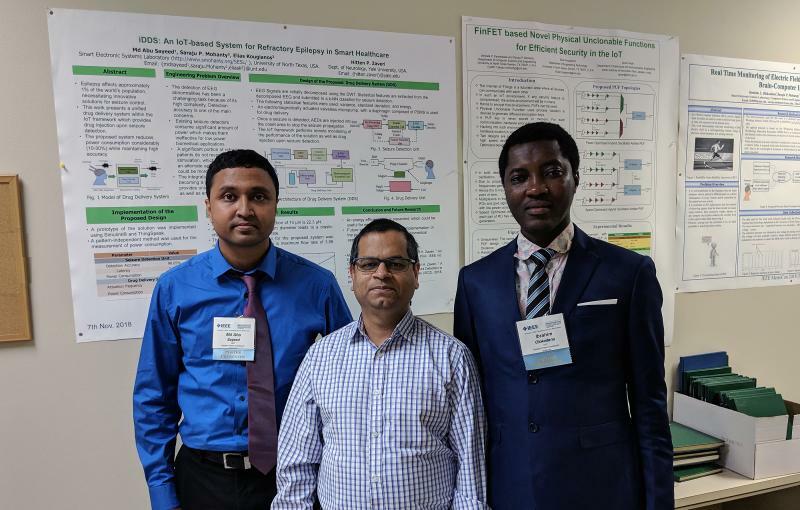 The second paper with Ph.D. student Ibrahim L. Olokodana was awarded Second Best Poster of the Conference with a cash prize of $500. The Poster competition was sponsored by industries including Oncor Electric Delivery, LLC. Prof. Mohanty is the major and Prof. Kougianos is the co-major professor for both Md A. Sayeed and Ibrahim L. Olokodana. The key idea of the iDDS: An IoT based System for Refractory Epilepsy in Smart Healthcare paper authored by M. A. Sayeed, S. P. Mohanty, E. Kougianos, and H. P. Zaveri is a IoT-based system that can accurately monitor and control seizure. A seizure consists of abnormal activity in the brain, which may result in loss of consciousness or convulsions. Approximately 1% of the world’s population and 2.5 million people in the United States are suffering from epilepsy. Seizures can be controlled through anti-epileptic drugs (AEDs) and surgery. However, approximately one third of epilepsy patients do not respond to AEDs, and epilepsy surgery is suitable for a very small fraction of epilepsy patients. Hence, an alternative approach which can provide an effective solution for controlling seizures is necessary. iDDS thus on the successful completion will have a significant impact. Prof. Mohanty’ group collaborates with Medical School at Yale University on this research. The key idea of the Real Time Monitoring of Electric Field Via Photonic Sensing for Effective Brain-computer Interface (BCI) authored by L. Olokodana, S. P. Mohanty, E. Kougianos, and M. Manzo is accurate monitoring of the brain signal using photonic sensors. The project will then be expanded to effective brain-computer interface (BCI) through photonic sensor and peripherals. This can have various medical applications including a paralytics person able to function without being depend on others. The Smart Electronics System Laboratory (SESL, http://www.smohanty.org/SESL) of Computer Science and Engineering (CSE) Department has graduated 9 Ph.D. dissertations and 26 M.S. theses in the last decade. The students are very well placed in the industry and academia. Eight of its graduates have received outstanding students awards at UNT. The SESL currently has 6 Ph.D. students engaged in cutting-edge research in energy-efficient and security aware smart electronics, specifically for smart cities and smart healthcare applications. The SESL is directed by Prof. Saraju P. Mohanty (http://www.smohanty.org) and Prof. Elias Kougianos (http://www.kougianos.org). IEEE MetroCon 2018 is the 31st year of the event that brings the latest technology to the DFW Metroplex. It typically features many technical tracks, industry exhibits, and a poster competition for students. The Industrial sponsors of MetroCon 2018 include Lockheed Martin, Oncor, Mouser, Spirent, errill Lynch, Rohde & Schwarz, Fresnel Technologies, and Edward Jones. It may be noted that in IEEE MetroCon 2017 also Prof. Mohanty’s group won both first and second prize on the same category.